The president-elect will only get smaller and less influential as broken promises pile up. 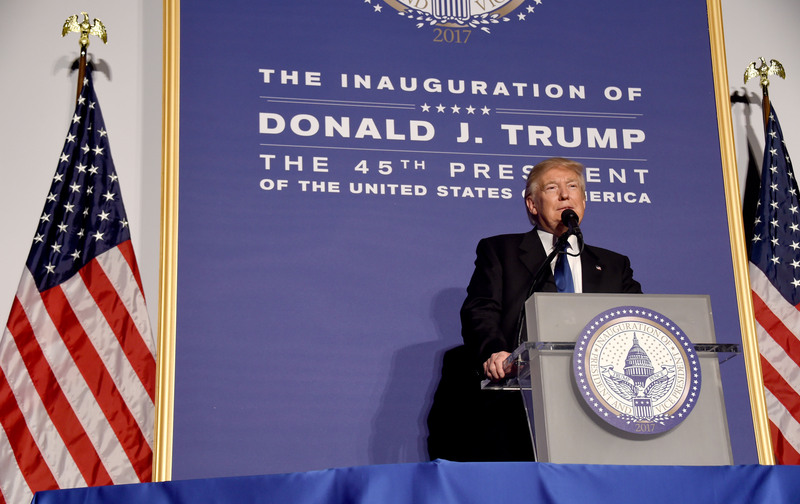 For many Americans, Donald Trump’s inauguration is going to feel more like a funeral than a celebration of democratic self-government. Trump is the most unpopular president-elect in at least 40 years. Pew says 68 percent of Americans find him “hard to like.” Only 41 percent approve of the job he’s done explaining his plans for his presidency. His “unfavorables” hover around 50 percent. If Americans wanted a performer to run the country, why not pick George Clooney? Instead, we got a slightly demented carnival barker with gilded hair and a bloated ego. The fright and gloom are understandable, but I have a hunch Donald Trump has already peaked. He won’t go away, of course—he will be Mr. President—but the air is already seeping out of Trump’s balloon. The president-elect has amassed a huge inventory of dubious promises, and I expect this powerhouse of American politics to get smaller and less influential as the broken promises pile up. The Trump era is going to be a fiasco for the country, but especially for Donald Trump. He was a brilliant novice on the way up, both funny and tough, astutely attacking the stale dogmas of both political parties. On the way down, he begins to look like a great American mistake and bait-and-switch businessman. As a salesman, Trump pitched an appealing nostalgia—a breezy promise to restore American “greatness.” “I alone can fix it,” he told the cheering rallies. His self-congratulations were over-the-top, sincerely-felt, though unconvincing. If Trump expressed his governing vision, it was usually limited to 140 characters. His longer speeches, if you listen closely, are always about the same subject—the greater glory of Donald Trump. We still don’t know how much Trump knows about governing. Or how much he cares. President-elect Trump doesn’t seem to understand that governing is a team sport. It requires complicated cooperation and fluid policy arguments. Small details produce awesome differences. In other words, for Trump, it’s boring. Trump is a big-picture guy who treats the politics of governing like it’s high-stakes mud wrestling. And it’s all about him. He shows little interest in or knowledge of policy specifics and spews gratuitous scorn and ridicule on his opponents. What we now know about Trump is he likes to make up stuff. When challenged by fact-checkers, he blames media bias. Then he makes up new facts that are also wrong. We also know Trump likes to hurt people with his words. He gave demeaning nicknames—“Little Marco,” “Crooked Hillary”—to his rivals. He regularly congratulates himself on Twitter, and uses the platform to counterpunch enemies or anyone else who questions his wisdom. He recently labeled Senator Charles Schumer, the Democratic floor leader, the “head clown.” But Trump’s party will need Schumer on some of the big issues, like trade reform and infrastructure spending, where the GOP doesn’t have the votes to prevail. Why dump on someone you need? Trump would rather spank them. The president-elect is also a prisoner of his own race-tinged ignorance. When Representative John Lewis, hero of the civil-rights movement, called him an illegitimate president, Trump fired back with an ugly and ignorant slur of modern Atlanta, the congressman’s home district. “Congressman Lewis,” Trump tweeted, “should spend more time on fixing and helping his district which is in horrible shape and falling apart (not to mention crime infested) rather than falsely complaining about the election results.” Never mind that Representative Lewis’s district is neither “crime infested” nor “falling apart,” but how sad it is that Trump seems to have forgotten his own “birther” campaign eight years ago, when he attacked the legitimacy of Barack Obama’s presidency. “Where is the birth certificate?” he asked then. You might say Donald Trump won the presidency by dwelling in his own personal world of “magical realism.” If Trump says it, it must be true… at least until Trump says something new and different. During his campaign, his rude, crude words and wicked falsehoods effectively destabilized the standard language of democratic dialogue. Rival politicians were baffled. The press was late in grasping the incendiary significance of Trump’s candidacy, and so was I. Some writers, like Jim Fallows of The Atlantic, explored a deeper explanation: Trump is a narcissist, totally self-absorbed in his own reality and oblivious to competing facts and understandings. He has an infantile reach of impulse and intellect; his world is self, food, now. This is probably not quite the case, but he seems to lack common traits of empathy and sincerity. The harshest analysis I read was by Charles Krauthammer, the conservative columnist for The Washington Post and a psychiatrist himself. In August, he was shocked when Trump attacked the Gold Star mother Ghazala Kahn following her appearance at the Democratic National Convention. “It reveals a shocking absence of elementary decency and of natural empathy for the most profound of human sorrows–parental grief,” Krauthammer wrote after Trump said Kahn wasn’t “allowed” to speak during her DNC appearance, where her husband spoke of their son’s death in the Iraq War. Now he is to be our president, and Trump’s “magical realism” is about to collide with the hard earth of mortal politics. The president-elect and his staffers are already busy trying to distance themselves from some of his more explosive promises, hoping they get forgotten in the excitement of a new party’s taking power. Trump acknowledged in passing that he is not going to prosecute Hillary Clinton after all. No more “Lock her up!” chants, he told disappointed supporters. Trump is also not going to “Drain the Swamp.” Indeed, some of the creatures from the Wall Street lagoon have been appointed to the important positions in Trump’s first cabinet. Trump still claims he will build the wall to keep out immigrants and make Mexico pay for it, but nobody believes him. He admitted the United States will have to pay for the wall then seek reimbursement from Mexico. Campaign promises often perish after an election, but even some of his cabinet appointees are disowning Trump’s promises during confirmation hearings. His nominee for secretary of state, Rex Tillerson, said he opposes Trump’s proposed ban on Muslims during his confirmation meeting. Nikki Haley, Trump’s nominee for UN ambassador, strongly supported NATO, which Trump recently called “obsolete,” during hers. These retreats and the high-risk legislation that lies ahead are part of why I foresee a hard road ahead for Republicans and their less-than-popular president.